Best deck box for cards? 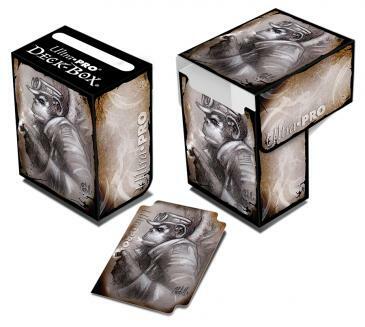 Can anyone out there recommend deck boxes for the cards that come with the game? Or any other suggestions for storage/transport of the cards? I've received my wave 1 rewards and the first thing I've done is put all the cards in card sleeves - awesome. But now I've got a whole stack of slippery cards and I'm not sure how to best transport or store them. I naturally thought of magic and the stacks of cards those players must deal with, so after some googling I'm now reading about deck boxes! But I'm none the wiser about what to get and I'm hoping for some info from you guys. Any recommendations or alternative ideas? Re: Best deck box for cards? Oh - good post! I tend to keep the demo ones together with elastic bands but a deck box is a much better idea! For a cheap and cheerful solution look at UltraPro, widely available and come in a huge range of colours, not the prettiest but they will keep everything safe. They do have some with pretty designs as well so you might be able to find something you like. Also, next time you have to purchase sleeves, I can thoroughly recommend Ultrapro matte sleeves. They do them in clear as well as colours and they stop that slippery deck problem! One example that might be good for the game theme! I do need to get one of those myself - my demo game cards are starting to get a bit ratty. I have most of them sleeved but not the Engine or Alchemancy decks.